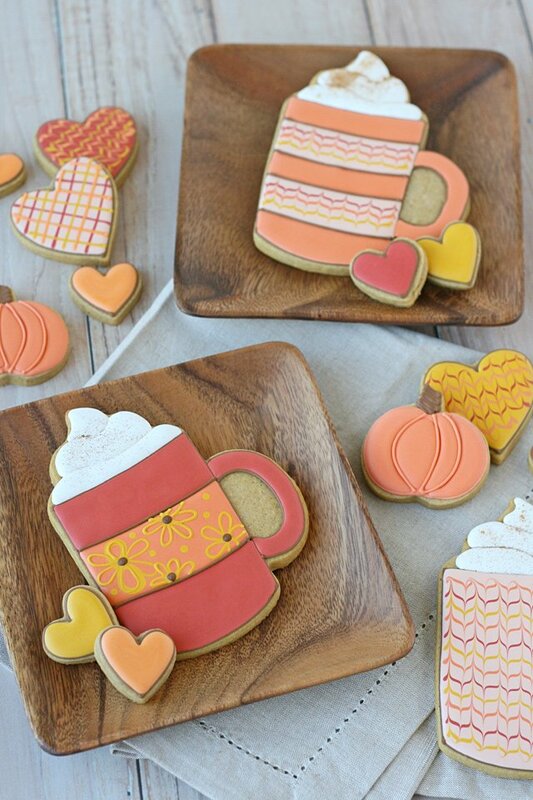 If you love pumpkin spice, these Pumpkin Spice Mug Cookies are especially for you! These delicious cookies are soft and flavorful and a perfect change of pace from my standard Sugar Cookie Recipe. Of course, feel free to use inspiration from this design with any of my rolled cookie recipes… classic, chocolate, gingerbread, coconut, orange, or sprinkle! I had lots of fun decorating this set, and made each mug just a bit different. 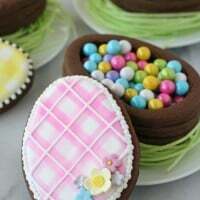 The aroma of these cookies is wonderful too, so that makes decorating extra enjoyable! I made these for my girls teachers (one of whom has a name that starts with a K, which explains the K cookie). The rich fall color palette was fun to work with, as I often find myself working with more “springy” and pastel colors. 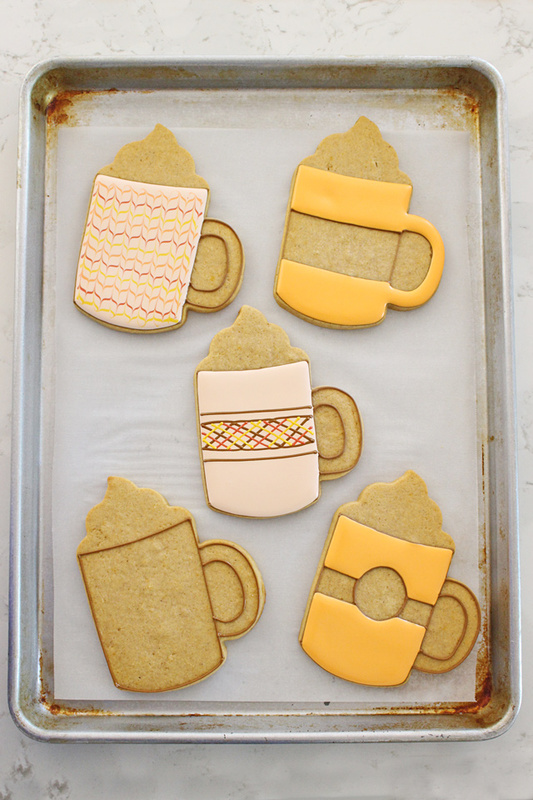 I think these Pumpkin Spice Mug Cookies would be super special wrapped as favors for any fall party, or take-home treats for Thanksgiving. Cookie cutter – I used this Coffee Mug Cookie Cutter from Truly Mad Plastics (they have a couple different sizes and styles that would all work well for these designs). If you don’t have a mug cutter with the area for whipped cream on top, in the past I’ve made designs like this by using a simple mug cutter and adding the top half of a cupcake cookie cutout for the whipped cream part. Decorating directions – You can see some of the basic steps in the image below. First, I outlined the cookies with a medium brown color, in an outline consistency (should be about the consistency of toothpaste). Then, once the outline has set up a bit (15-30 minutes), begin filling in with a thinner flood consistency (or about the consistency of shampoo) icing, based on my design idea for that individual cookie. For the cookies with the sweater/zig-zag pattern on the icing, I flooded the cookie with one color (for example an ivory/flesh-tone color in the cookie below) and then while that base color is still wet, I immediately added lines of colors (dark red, orange, yellow) horizontally across the cookie. Then, immediately, drag a toothpick vertically through the wet icing, creating the effect shown. 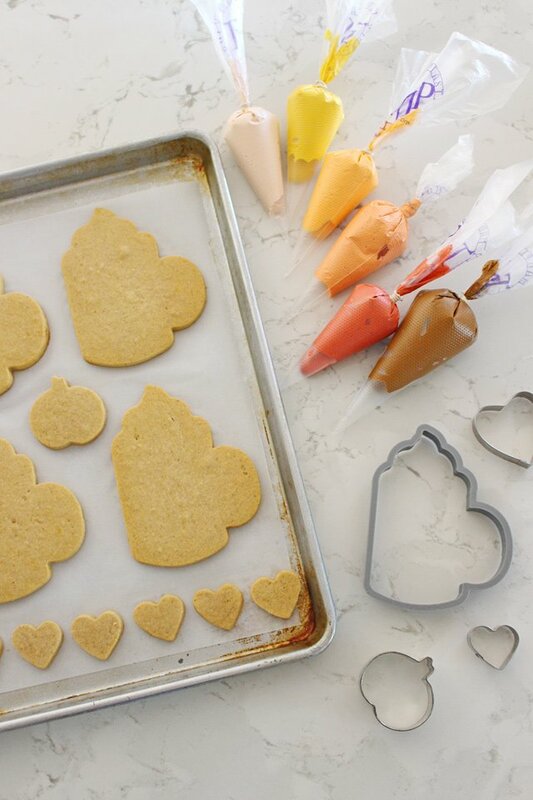 For the whipped cream area on these cookies, simply outline and flood in one area at a time, allowing that area to dry (about 30 minutes) before adding icing that will touch it. After the entire whipped cream area was dry, I sprinkled some ground cinnamon on top and it stayed in place quite nicely. 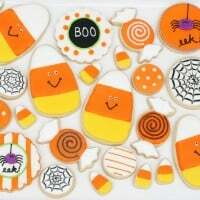 I hope you give this Pumpkin Spice Cutout Cookie Recipe a try and have fun decorating some special cookies for your family and friends! Once again, an outstanding job, Glory! These look not only pretty, but very tasty as well! Wow!! Your work is amazing!! 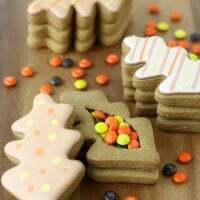 I have been making your pumpkin spice cookie recipe since you posted it 4 years ago. It’s always a winner! 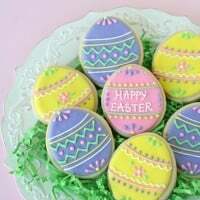 Wow, these cookies are gorgeous! I am so impressed! 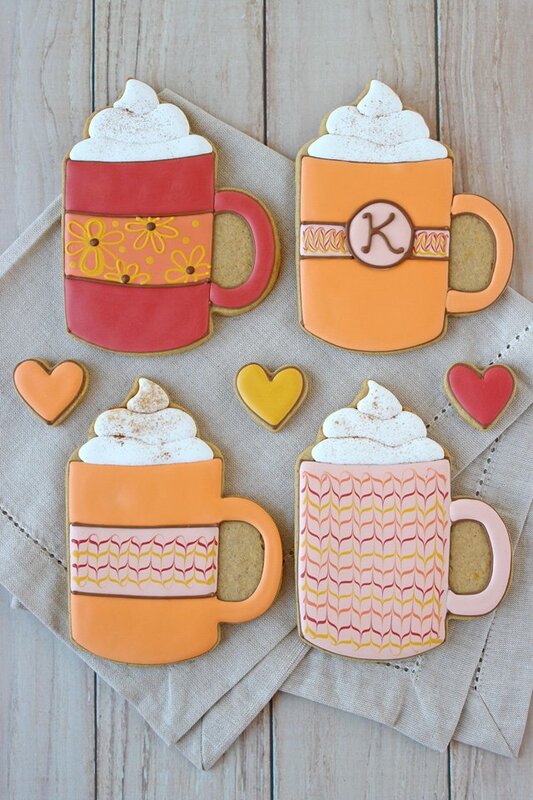 I made these as soon as I received the adorable mug cutter from Truly Mad Plastics! All I can say WOW!! This recipe is a KEEPER!! 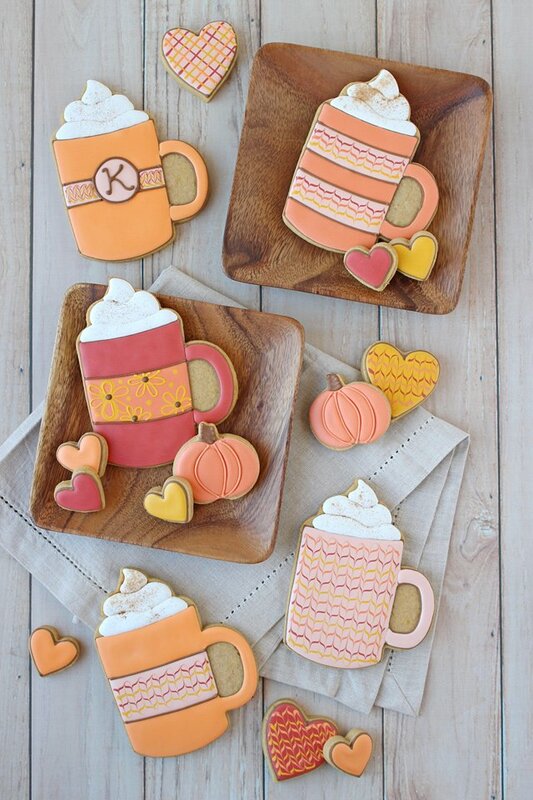 I love all things pumpkin spice and this cookie tops my list of favorite pumpkin spice treats!! I DID add the pumpkin and I think it made the cookie perfect! Surprisingly, though, the dough was not difficult to work. Thanks for a new fave recipe!! Glory, these cookies are brilliant, adorable, and look delicious. You’ve wowed me again! 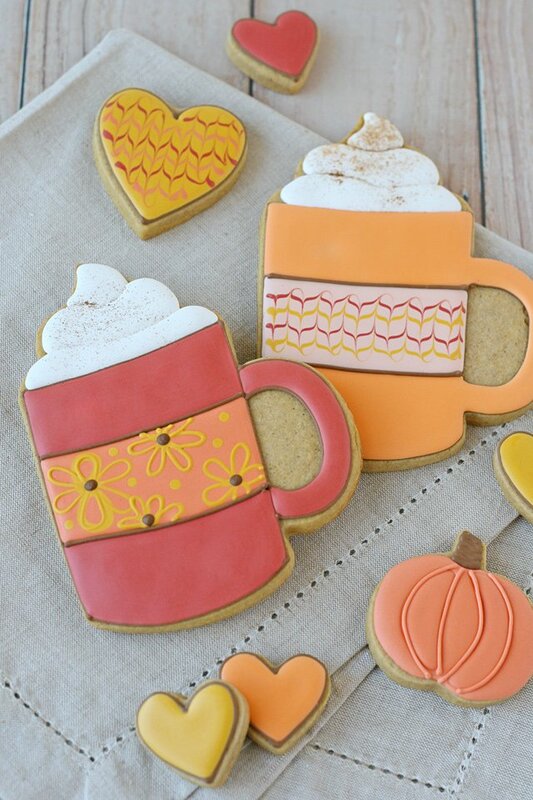 I LOVE your Pumpkin Spice Mug Cookies! You even made one with my initial! They are not only BEAUTIFUL, but look soo yummy too! These are super cute! Wish I had the patience and skill to make some for myself!